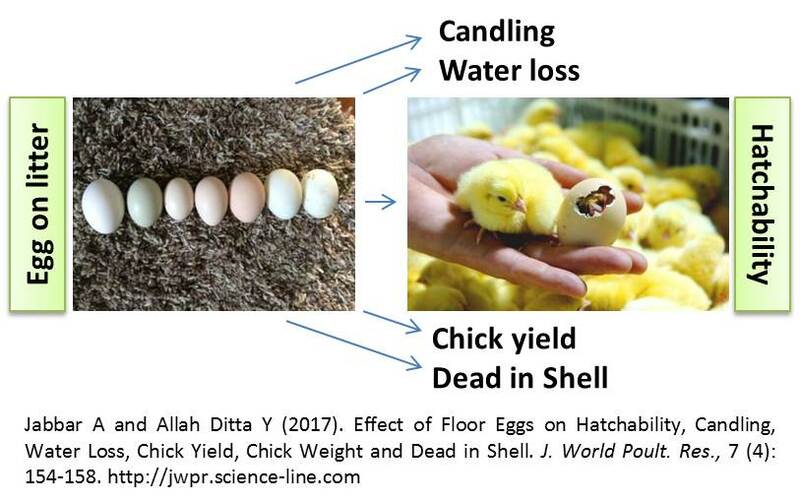 Effect of Floor Eggs on Hatchability, Candling, Water Loss, Chick Yield, Chick Weight and Dead in Shell. Jabbar A and Allah Ditta Y. A chicken with high quality resulted from a clean egg, not broken, and not containing cracks. This experiment was performed with the goal to evaluate the effect of contaminated eggs on hatchability, egg water loss, chick weight, chick yield, DIS, A grade and B grade chicks. Eggs (Cobb 300, Ross 308, Hubbard classic n=8616960) from six different farms were collected and divided into two groups. Group A containing good quality eggs and group B contaminated eggs or floor eggs. Each farm participated (n=1436160) eggs for sixteen replicates. Candling was significantly better (P < 0.001) in all flocks of group A as compared to B regardless of the age and breed of broiler eggs. The eggs from group B presented significantly less water loss as compared to group A. Chick yield was significantly better for group A than group B. Similarly, Chick weight, quantity of A grade chicks was significantly better for group A than group B. In short floor or contaminated eggs negatively affects the hatchery parameters and becomes a source of contamination for chicks in the hatchery and farms.